Background : Worked for 10 years as a gardener at Ballarat City Council. Left his estate (about 1000 pounds) to the Ballarat Orphanage where he grew up. H. Lambrook (next of kin) was the orphanage's superintendent. Service & personal summary At enlistment : single. No previous military experience. Blue eyes, brown hair. Marks / scars : right index finger terminal joint deformed from accident. 24/05/1940 Taken on strength Recruit Reception Depot Caulfield, Victoria. 29/07/1942 Reported missing in action believed prisoner of war. 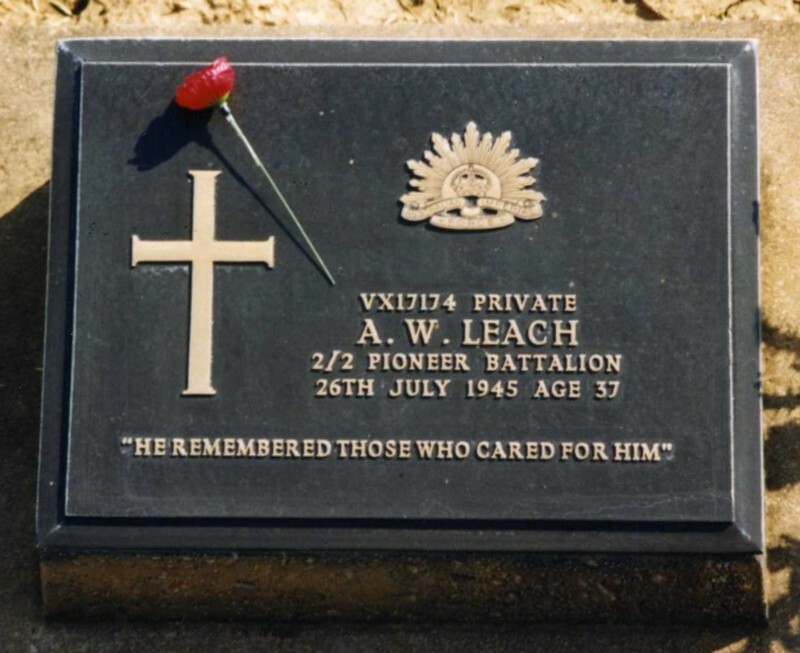 26/07/1945 Died of illness whilst prisoner of war (malaria). 02/04/1946 Exhumed from 12 Kilo Camp. Reburied Kanburi Allied War Cemetery Grave no. 1455. Location report no. 11/6/10.